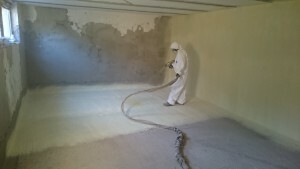 Sprayed polyurethane foam (as the name suggests) is an insulation technique that is applied to the surface in sprayed form. It can be used to various types of buildings, residential or commercial alike. Sprayed polyurethane foam is a plastic insulation foam that is applied in a liquid form then it expands up to 100 times to its original volume, creating an excellent airtight layer of insulation. Sprayed foam insulation can be used in many different forms, from soft/half-rigid to high density roof insulating foam that can withstand the weight of a person as well. This technology is capable of not only filling gaps, but due to the specially developed two-component material it uses, it also creates a perfect thermal and damp insulation layer. It is applied with an industrial machine that can only be operated with the appropriate qualification. The foam is applied to the surface with a high-pressure spray gun, this creates a perfect insulating layer, that will fill the tiniest gaps as well. As the spraying method is continuous we will be able to create a homogenous layer. 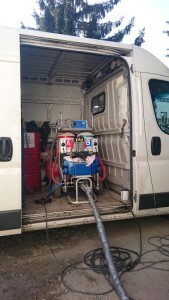 Sprayed foam is applied with a pressure between 150-200 kPa, ensuring the aforementioned continuous layer, therefore the resulting insulation value will be excellent. Insulation boards are incapable of preventing condensation or maintaining surface temperature, this can only be achieved by closed-cell foam that will not absorb heat from its surfaces, eliminating heat bridges – creating perfect insulation between the external and internal space. Has very tight structure, creates much denser and more rigid layer than the open-cell foam. Recommended application: on surfaces where thermal and damp insulation would both be necessary (e.g. screed where traditionally thermal insulation is installed on top of damp insulation), however closed-cell foam can replace these two layers by itself. (find further details here) Also by footing walls where both thermal insulation and damp proofing are indispensable, facades or roofs where the thermal insulation is exposed to humid air, internal/external underground insulation where the humidity is present in the surrounding soil. Poliurea can create a 100% water tight layer. This is less dense foam than the closed-cell. 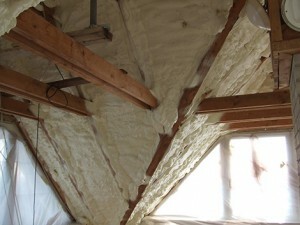 Has a better thermal insulating value than the closed-cell foam, however it is not watertight. Can be applied to any kind of surface and will eliminate draft. Excess material (once the foam is cured) is easy to cut so the surface is prepared for installing drywall. Its features are quick application, short curing time and no heat leakage. 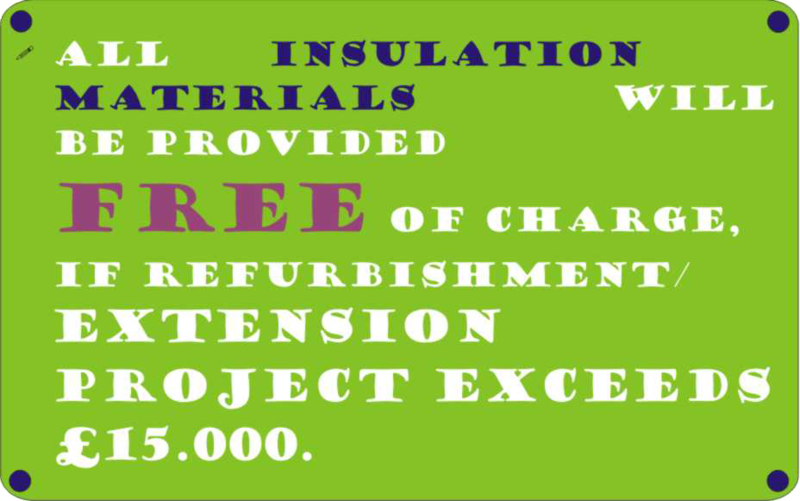 Recommended application: internal insulation of roofs. Also for insulating cavity walls, internal walls (used for its sound-proofing feature), and joists above fitted ceilings.  Insulating light gauge frame buildings’ walls, joists and various other areas in industrial buildings. Poliurea is an excellent coating/covering system that is very versatile in application. Its most common application is for creating a watertight layer on concrete and steel structures, but it also acts as wear-proof coating. Its biggest advantages are fast application, versatility and excellent material properties. It is usually applied in sprayed form but it can be injected or poured as well. Because of its excellent physical properties it is used to coat/cover surfaces that need to withstand extreme wear. The application of poliurea coating has increased by 70% in the last 5 years in Europe because of its outstanding properties and versatility. Recommended application: insulating flat roofs and pools due to its water tightness, UV resistance, flexibility, wear resistance and its ability to withstand chemicals. 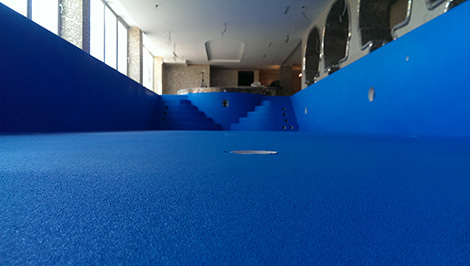 Also can be used for waterproofing basements, fixing ruptured pipes or covering balconies, terraces. Combining it with closed-cell foam we can achieve excellent thermal insulation and water tightness. As always, do not hesitate to contact us if you have any questions or just feel like sharing your thoughts.